After watching giant tortoises cavorting in the woods yesterday afternoon I was hopeful that we might see something a little more exciting. Today we’re scheduled to go snorkelling. The boat has shorty wetsuits, masks, snorkels and fins and most decide to use them. My son, who visited the Galapagos a couple of years earlier, warned me that the water is “cool” and suggested I take my full 3 mm wetsuit – and I am glad I did. Sid, resplendent in his red mankini (or “budgie smuggler” as the Australians call it), says he doesn’t need anything else to keep warm. I have a feeling there’s going to be a very small budgie in there once he hits the water. I would include a picture of him in it, but I've been warned about putting inappropriate images on the web. Several others, including Marla, the girl from Richmond are also swimming in their regular attire. I have included a picture of her. (Note the shark below her). I have my own mask, because without a prescription mask I’m totally blind in the water and have no idea where I am. The last time I went diving without one I followed two large manta rays for half an hour thinking they were members of my group. Our first snorkelling site is Cerro Brujo, also known as the “Sleeping Lion” (check out the picture) on San Cristobal’s north coast. When you get closer you can see that it’s actually two little islets with the lions head a separate pinnacle. We’re going to snorkel through the gap between the two islets. Mr. Sandhu, lacking any swim gear of his own, opts to stay on the dinghy. 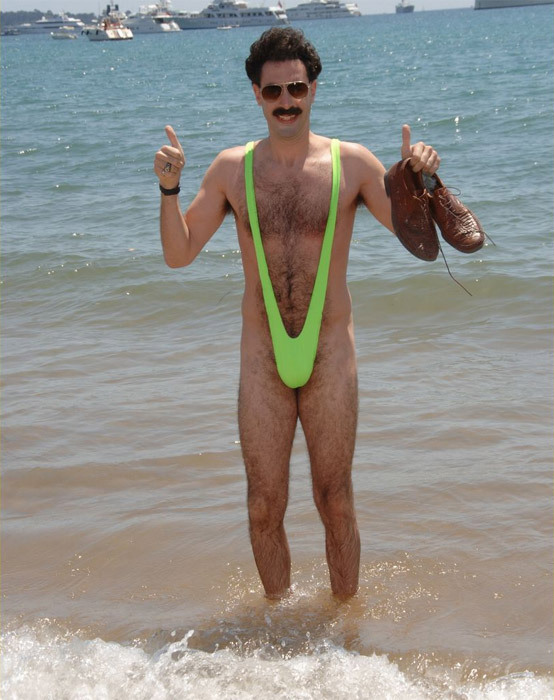 Sid graciously offers him one of his mankinis; but the old guy wisely declines – less the sight of an 83 year old overweight Indian guy in a budgie smuggler cause us all to put our eyes out – or go insane. The first thing I notice is a six-foot white-tip shark looking backup at me. This is okay - I actually like sharks – having dived with them on numerous occasions and dealt with them in banks. However many of the group haven’t – and make like jet skis as they race back to the boat - until Pedro, our naturalist and guide, calms them down telling them reef sharks are essentially harmless – most of the time. Looking down I see perhaps fifty more of them swimming thirty or forty feet below me. I also see diamond rays, and turtles. This is perhaps the best snorkelling I've ever seen – and I've been in a lot of places. After about an hour we head back to the boat, warm showers and drinks before supper. 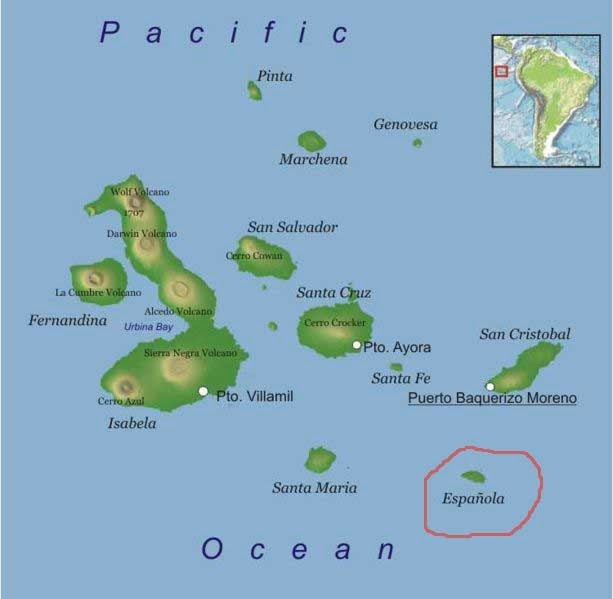 During the night we have moved from San Cristobal to the island of Espanola – the southernmost island of the Galapagos. If we were impressed with the previous day’s marine life, we’re told we’ll be equally impressed with the land animals on this island. We disembark from the boat and get into the dinghies for the five minute trip to Gardner Beach which we’re told is considered one of the most beautiful beaches in the Galapagos Islands. As we approach the beach it seems to be covered in basking fat tourists – it’s only as we get closer we determine these are not tourists, but California sea lions enjoying the beach – hundreds of them! Our arrival doesn’t bother them in the least. Pedro issues a stern warning that we’re not under any circumstances to touch the animals. The message seems to be lost on Sid who has wandered off and is lying next to a particularly large sea lion taking a “selfie” picture. This results in yet another reprimand for Sid who seems to shrug them off like water on a blue footed boobie. There are several large marine iguanas and Sid’s attempt to get friendly with them is instantly rebuffed. One of them bobs his head at Sid a few times and sneezes right into his face. Pedro tells Sid not to take it personally. He explains this is how iguanas expel the salt they've absorbed swimming in the ocean – ort of like a lizard salt-shaker. Sid is not impressed with Pedro’s explanation and comments that the iguana might make a fine pair of shoes. Gardner Beach has one other endearing feature: flies – billions of them. No matter where we walk we’re covered with them. I slather myself in insect repellent – it only attracts more. They look at insect repellent as people marinade. We take the requisite number of pictures and retreat back to the boat with a black cloud of flies trailing in our wake.